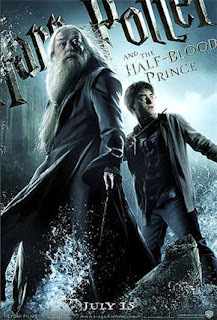 "Watch a film as a film not like a book"
If you are a die hard Harry Potter fan who read the book again before watching this film, I bet you were dissappointed. But if you are a fan who haven't read the book will be amazed on how the screenplay was delivered. Let's start with the bookworms. We all realize that some points from the books never saw the light in the film. Harry on detention, the operation lessons, the non verbal spells, the importance of the felix felicis, the quiditch cup, and we could go on and on. Some scenes where altered also, like Ginny kissing Harry instead of the opposite, the absences of the Order when Dumbledore died. I just laughed when it was only mentioned in the end that Snape was the Half Blood Prince, thus making the title Half Blood Prince pointless. Anyway, let's look at it on the film side. like I mentioned, the screenplay was awesome. You can feel the "mature" theme of the film far from all the kid stuuf of the previous. The scenes where shot wonderfully and the delivery of the lines captivated me. The best scene was the one on the cave where Dumbledore drank the poison so they can obtain the Horcrux. these two actors, Michael Gambon, in my opinion delivered a spectacular part that pierced our hearts. Although there some flaws in the film like Hermione casting a spell without using a wand and Harry Potter exchanging spells with Draco Malfoy non verbally, can be forgiven with the hotness of Emma Watson, Bonnie Wright and Evanna Lynch.